TLDR; If you see ink flooding around the die when you touch a Sharpie to the face of a Neopixel, you should probably throw away the batch. Disturbing video example after the jump. UPDATE 1/5/2017 – Seems like a lot of people in the Neopixel community have been bitten by ugly pixels! In response, we are creating a registry of good and bad pixels at the end of this article to keep track of our cumulative findings. Please let me know if you have any to add! I started building panels with the new strips and the pixels were literally dying faster than I could finish the panels. Some pixels would fail with one color stuck on, but most would fail completely, which killing the whole rest of the string because of the way these pixels daisy chain. Yikes! Is there any way to tell Neopixels are lemons before you start building stuff with them? In a high quality pixel, the clear potting should form an airtight bond with the rest of the case. This seal keeps moisture away from the sensitive parts and holds everything solidly together. It’s so bad it physically hurts to watch it. Don’t even give that batch of pixels to your rival hackerspace. I have purchased more than 100,000 of these pixels from Mr. Zhang of the past year and have yet to get a bad one. I have many that have been running continuously for months. Note that when I order from him (my strips are all custom length), I specifically ask for the “best quality” pixels, although I don’t know if that changes what I get. These are the pixels form the above article and they are unusable. They have a DOA rate of about 1 per 100 and then a mortality rate of about 1 per 100 per hour. The failures seems to be due to the terrible silicon potting, so don’t necessarily judge a pixel to be crappy just because it has this layout- do the above sharpie test to check. Q: Can my highschool/hasckerspace/LED club have your crappy pixels? A: If you can convince me that your project is a good match for free but really crappy pixels, then they are yours. Projects where the pixels are destroyed in the process of being used are encouraged! My hunch is that these are not worth saving. If moisture and oxygen have already made their way in then some damage may have already been done. Also, the bad QA on the potting might also be indicative of other problems. That said, I have a LOT of these so LMK if you want to rescue them! 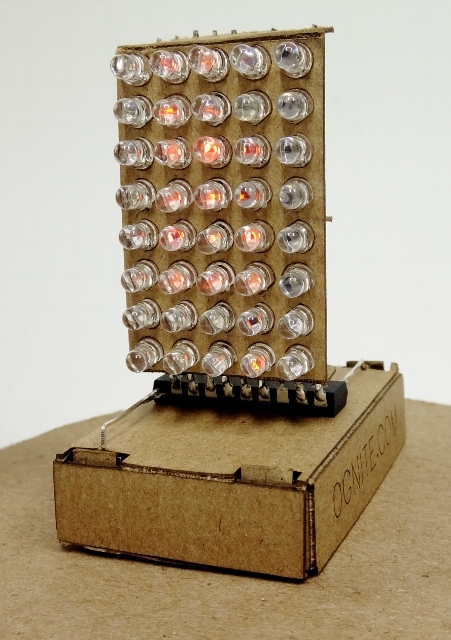 Really interesting way to test Neopixel batches! I’m curious if you’ve had any false negatives with any batches. Unfortunately these pixels continue to die at an alarming rate. I think once oxygen and moisture get to the bonding wires and die, it is just a matter of time before the pixel fails. I don’t think any attempts to save them would be worth it, or even succeed. Have you ever seen cases where the pixels lose one or two colors (either one of R, G, or B diodes)? I bought a reel of diodes directly from Worldsemi and after I had a fab shop assemble it i’m seeing this issue. The data line is still daisy chained fine but individual pixels will lose one color, either temporarily or for good. I’m wondering if it’s a moisture issue or a temperature effect because after running them for a little bit they warm up and the diode reconnects (most of the time). Yes, I’ve seen this on low quality pixels. Sometimes if you look under a microscope you can see either the bondout wire (the tiny gold wires) that goes to the dead color is broken or disconnected, sometimes because of a crack in the potting that tears it. Sometimes also you can see where the potting has let go near the chips for the dead color and presumably disconnected is from the conductive substrate below. I can’t seem to observe this. As I mentioned, some diodes reconnect after a few minutes of running, making me think the bond wire has a very very small break and is affected by thermal expansion. But as far as I can tell the bond wires don’t appear to have a break. Here’s an album I took using a microscope of a pixel where the blue diode has failed. Nothing pops out at me. Here’s an odd one from Amazon: this is supposed to be a WS2812B but the bonding looks unique. It’s from a 16×16 flexible substrate panel and even more strange is that all the LEDs are oriented the same way, yet the panel is clearly signalling in a zig-zag pattern (suggesting that each alternate row of LEDs actually has DI and DO reversed – usually the alternate rows would be oriented in opposite directions). The fact that all three colors are on the same pad is strange – usually blue is separate. I’ve got a set of concentric rings (Mokungit branded 93 LED device) on the same data line and power supply for comparison that’s nice and steady (and clearly has the more typical blue-on-its-own-pad WS2812B configuration)… when this 16×16 panel goes down to RGB(1,1,1) it isn’t as bright as the rings, and the LEDS have a noticeable flicker to them at or near that level too. Available power’s more than adequate for this setting so it’s not that… it’s these weird LEDs. Anyway, it’s not the best thing I’ve ever bought but I do like the configuration (versus every odd row being oriented differently) – I’m curious if anyone has ever seen these peculiar LEDs before? As one is intermittent (bonding wire I suspect, pressure-sensitive) it’ll be making a return trip, and I’m reluctant to get another (I see similar ones elsewhere – it’s rather easy to spot whether the dies are alternating or all oriented the same). Thoughts? I have a bunch of WS2812B LEDs from various sources. I just realized these are the same ones I’m having issues with (intermittent connectivity, pressure/temperature sensitive), whereas my more stable supply in flexible strip form has the blue diode on the other pad. That’s very weird though, having all three on the same pad makes more sense since it’s one less bond wire to attach, plus the diodes are closer so you get better color mixing. If you still have the bad LED array, run it in full brightness white for a while (~10min), does the blue eventually turn back on? My experience is it will display white for about 30s, start flickering yellow (blue diode failing) then after about 5 min it will have turned back to white. Some LEDs are pretty bad though and fail completely, never to come back on. In some cases it’s actually the red or green diode that fails instead. I can’t recall exactly but I feel like there has been at least one case where two diodes failed in the same LED package. Which is hard to pick up on because the traces on that top row look like a single trace running down the middle. Not obvious because the package itself hides the important connections. I noticed that alternating board pattern after I posted this so yes, they are knockoffs but not any more unusual than that. I just got another 16×16 board from a different person on ebay – same junky LEDs and no connections on the back so it’s being returned (not what the pictures showed nor what they claimed when asked pre-purchase). But I also got a tape reel portion with 100 of the LEDs (same crappy ones as on this and as on the other board), so maybe I’ll keep the one board I got and replace the bad LED. At least it’s a known quantity versus this even crappier board I just got. The blue LED draws more current and probably dissipates more heat so keeping it bonded to a separate pad is preferable IMHO. As for the “after a while it works” aspect, yes, that’s exactly what happens here. It’s really frustrating. Mokungit seems to make some great boards – finding them is tough though. These knockoffs are junk. Speak of the devil! The Mokungit store on Amazon has their 16×16 panels coming in in two days (ASIN B01GCPJYD0)! Ordered and will compare. Either way the ebay one is going back and if the LEDs on the branded one are right then the extra (inferior) LEDs are going back too. Will update when I get it and examine it. My frustration is that it doesn’t really matter who assembles the panels/strips, the problem is the LED package itself. I ordered mine directly from Worldsemi through Alibaba, you’d expect them to have a very low scrap rate. It’s not like I can test these SMD LEDs easily when they arrive in tape/reel packaging prior to assembly. I shouldn’t even have to when they’re coming from direct from the manufacturer. I assume Mokungit is having the same issues. It could be that this type of package is inherently flawed and you need to find panels/strips that have LED packages with the blue diode on the other pad. Well, the 93-LED ring I got from Mokungit did NOT have the same LEDs I’ve been seeing on these 16×16 panels. Instead, it had the better ones I’d expect. That’s the only reason I’m hopeful that the LEDs on theirs will be the same, better ones. However, if WorldSemi is actually selling WS2812Bs with all three LED dies on the same pad now, then I’m concerned. Are you seeing the flicker below #0F0F0F or so? I see it even at #010101 on the latest ones, while I see no flicker at all on the ring above. Adafruit has a 16×16 WS2812B panel… at twice the price (and maybe you get that or maybe you get the SK6812, depending on what they send – or you can get a APA102 AKA DotStar panel). I like that place but LEDs are always double the cost there. I’m not sure what the fascination is with it being flexible either – I’d be glad to have one the same size on a regular board (like the 8×8 ones out there). As for the Mokungit one, we’ll see what I end up getting next week. The fact that it has the connectors on the back versus the fragile corners is a plus to me, and if it’s made with the non-flickery WS2812B LEDs it’ll be a win I think. The world definitely needs a good/bad pixel registry – so let’s make one! To get things started, I’ve updated the article above to include one very good pixel and one very bad pixel that I’ve encountered. I have lots more samples, but it will take me time to get them posted. In the meantime, feel free to cross-post mine on your site, and with your permission I’ll pull yours onto mine so anyone searching can find them! Thanks! And yes, feel free to cross-post from mine (hotlinking to images may not work though – just reference the post for best results). I’ve added a more prominent note on my post referencing your site here. It seems it’s not horribly difficult to get individual LEDs that are reliable, but finding devices built from them *is*, and now having seen two different devices *and* part of a reel with this novel “RGB all on the same pad” configuration, I wonder what’s going on. Are these knockoffs? Are they something straight from WorldSemi? The design looks sloppy to be honest, and the die is odd too – the bonding pads are in an unusual configuration, making me wonder if it’s even a WS2811 chip. It’ll be really interesting to see what Mokungit delivers next week. I asked about getting a few individual LEDs when I ordered the board the other day and just got a reply saying they are out of WS2812Bs. I’ve asked for clarification as to whether that just means they can’t sell me a few spares or if it means they are sourcing something new (and what the new thing is). I’d also pinged WorldSemi back when I first got this 16×16 with the weird LEDs but never heard back as to whether it’s one of their designs or some phony knockoff. In other news, I really should get a good microscope. :-D However, a good one weighs a ton and I’m short on space. I do have a couple spares of the weird LEDs I mean to delve into someday. Update: I got the Mokungit 16×16 board today – while there is no branding on the board itself, and the flex and silkscreens appear to be identical to the first one I got, the LEDs are definitely the “good” ones I have on my Mokungit 93-LED ring (the “good” ones as pictured by Doug and Josh). It seems to me that the substrates (at least these flex ones – Mokungit actually has their name on the 93-LED ring thing) and the LEDs are being sourced separately by different sellers. So far it seems Mokungit is sourcing the “best quality” LEDs, while others are sourcing the junky ones (the ones with all three LED dies on the same pad are probably the crappiest of all). To amend what I said about the flicker issue, none of these seem to light at RGB(1,1,1), unless you’re updating quickly (at least with the library I’m using) – that’s when the cheaper ones get a pronounced flicker. I wonder… as the eBay seller suggested the cheap ones they sold me were actually SK6812’s (which wasn’t part of the deal), how does one distinguish WS2812B from SK6812? While the cheap LEDs I’m seeing are definitely knockoffs of some sort (and uniquely so, versus the usual knockoffs), it’d be good to know what’s what when it comes to SK6812 vs WS2812B as even Adafruit substitutes one for the other now (e.g., per their 16×16 description, “May ship with either WS2812B or SK6812-based LEDs. They are the same brightness, color and protocol”). Would be great to see a good die shot of a “best quality” SK6812 to compare. Guess who sold me the first 16×16 that started my little adventure with the weird LEDs I posted the photos of? ALITOVE. Needless to say, I put little stock in their die shots (or the rest of their sales photos) right now, given the disparities. So I’ve done a bunch more snooping and it’s interesting that you mentioned the SK6812. My coworker only just recently found out about them and we were investigating them as well. Coincidentally, my Chinese supplier for the good LED strips I’ve been getting, without cause, changed the email thread subject from WS2812B to SK6812. This suggests that the good stuff I have might be actually SK6812. This is actually quite frustrating because many dealers are labeling these different packages and variants as WS2812B when they’re not. Very interestingly the differences are just a bit of timing and speed, but otherwise it behaves the same (brightness, protocol) which makes them harder to differentiate while using them. Regarding your flickering test, the SK6812 might perform better because the PWM is twice as fast as the WS2812B apparently. The main things I’m noticing is IC variant identified by # of pads, bond wire placement, orientation and also the LED diode placement. I should point out that Worldsemi’s naming convention is stupid here because the WS2811 is the IC name only, not the integrated diode package. If you look up the datasheet it’s only an 8 pin SOIC. 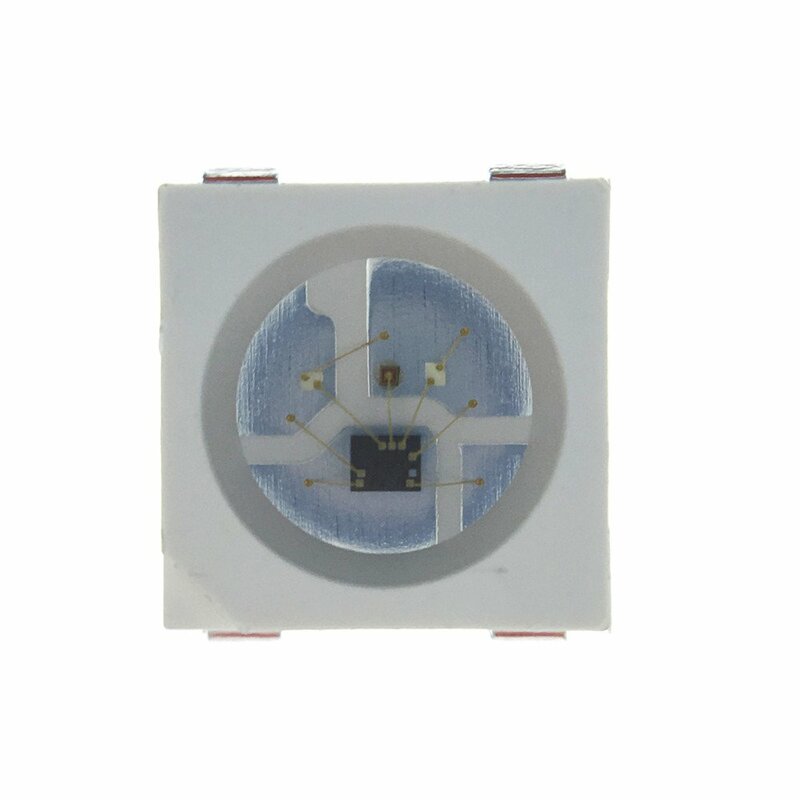 The WS2812(S) 5050 LED package is the integrated package with R,G,B diodes plus the WS2811 IC embedded in it. WS2812B is the new revision where the IC is different and it reduces the number of pads down to 4. You can easily identify the difference between WS2812S and WS2812B by the difference in number of pads. Next we have variants in WS2812B. From what I’ve seen so far I can identify the IC by the bond wires. WS2812B has 3 very close pads and 3 spaced out pads on either end of the IC parallel to the short edge. I have seen this IC on at least three different package layouts where the placement of the Blue diode is either on a separate or the same pad as the other two diodes. In that last blog, you can also see a slight difference in the pad shape inside the lens. Lastly, identifying the SK6812. The biggest indicator seems to be that the IC is orientated 90° to the WS2812B. This is great because I can identify it without a microscope. Also there is a set of 3 closely placed bond wire pads along the long edge of the IC. Feel free to repost. I put a disclaimer that these identifiers haven’t been confirmed yet. It would help a lot if you guys can look at your own inventory to see if you see similar patterns. Oh right, and the last identifier is the size of the integrated IC. On Tim’s blog he measured 0.8×1.05mm for WS2811 and 0.6×0.8mm for the SK6812. I see the store you recommend has $3/meter. (100 meters at a time) Should I stay away from these? At least based on the photo, these do not look like the good ones I get. I wish I had a better spec than asking for “best quality”, but that’s what I do and it works! They have an alibaba page, but I don’t think they have an aliexpress store. “At the beginning of 2016,there are many issues of the WS2812B LED. Many clients complianed the WS2812B led strip are high failure rate after use a few days. In order to solve those issues,we produce SK6812 LED to instead of WS2812B LED. So we all use the SK6812 led strip to our clients,such as adafruit,Pololu….. But the protocol of the SK6812 is the same as WS2812B,also we can use the same controller and program. In addition,the performance of the SK6812 is more stable than the WS2812B led. “Becuase those two LED are the same protocol,we can use the same controller and program. upvote for SHIJI.. Rose is the best. 90-95% sure they are the real supplier for “neopixels” to adafruit. i know for sure they supple the common-die RGBWW/CW analog’ led strips. Back in May 2016, I bought Adafruit Neopixel 8X8 matrixes to work with a SilabsC8051F97x micro-controller. BTW, your site’s explanations were a great help. However, for my project to be viable, I need a much lower price… at the same quality, of course. To be sure, I checked and found your post “A Quick Test for Crappy WS2812B Neopixels”. Surprise! My WS2812’s look like SK6812’s, and the PWM frequency >1kHz confirms it. It seems the SK6812 is gradually replacing the WS2812, which is a good thing, but from now on, I will keep my eyes open! 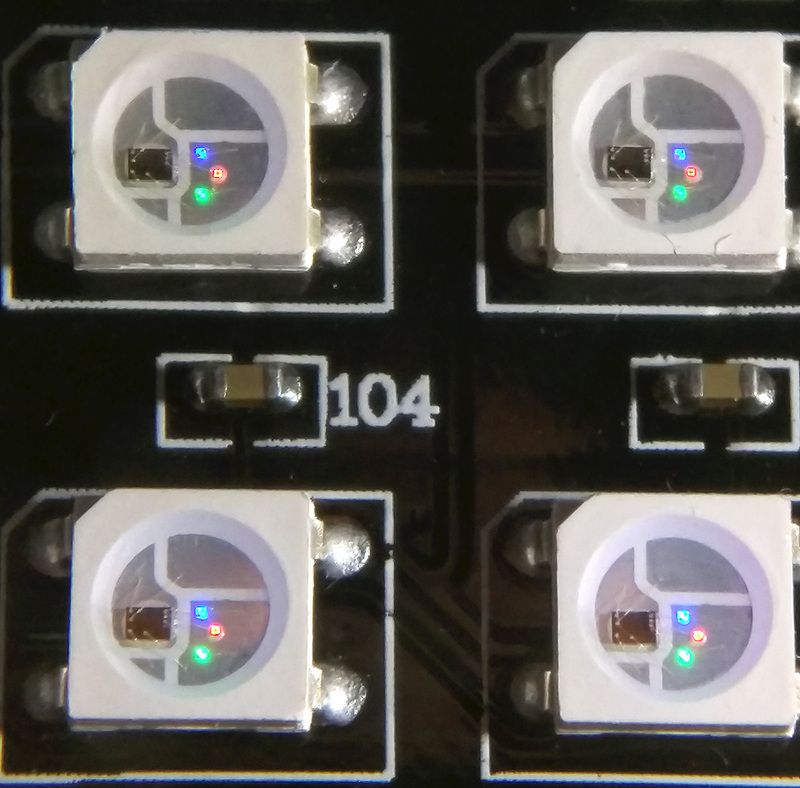 One afterthought: The Neopixel problems seem to be mainly mechanical (broken bonds, ingress, loss of integrity), so maybe pixels on a rigid substrate should be less stressed and thus more reliable than those on flexible supports. Any data on that? I’ve purchased WS2812b strips from “BTF Lighting” who have a store on Amazon as well as on AliExpress. I’ve had multiple strips die on me, though I’ve repaired them over time with extra strips. I have also performed the marker test above and the ink does bleed into the pixel. I’ll keep using the strips I have for random projects, but will invest in better strips from more quality vendors next time. I’d also like to know if this is a legit WS2812B – these are from a seller on Amazon. It also passes the sharpie test. Hi, might explain why I kept having failed LEDs on my strips. Interesting note, its worth trying a “stress test” before spending mucho $$$. If it fails at 55C after 6 hours then send them all back unopened, you will avoid much pain and suffering with intermittent failures in this way. Has anyone had issues with LEDs from Gree-LED? We recently had a batch come in raw strip, no silicone tube and are experiencing an extremely high failure rate. I can’t determine if it’s power supply issues (some strip is about 2m, 120 LEDs) or actual failures. I’m using the WS2812 variant. Ahhhh almost spent £20 on a new power supply, tried your test and the ink soaked right in – amazing! I’ll spend that money on new pixels instead, thanks!